Trying to be invited at the most important biennial: The mother of all Biennale di Venezia, started more than a hundred years ago in Venice. Any person with proved trust in reason knows that an approach like that of Pino Boresta is automatically destined to fail. The Roman artist, in fact, for years has worked persistently to prompt curators and critics to invite him at the event, but with care to operate in a direct, unpleasant and no-licker manner. The blitz, the noise, the contestation in public debates, all measures of disturbance in which they are – programmatically – wrong approaches, methods, tones. We could even say that if this does not happen (that is if his requests were successful), he would deny himself the pleasure that nasty children often have to mess up the clean swot’s copybooks. And it’s too easy to develop winning strategies. Try to imagine how could be losing strategies. 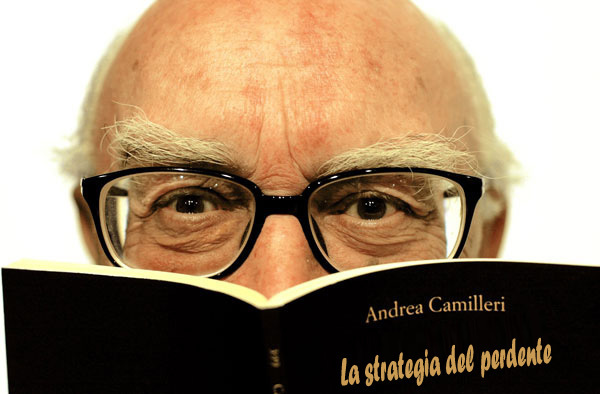 Anyway Boresta is that kind of personality: He is essentially an artist who loves to make questions, loudly breaking “cabasisi” (to break the balls) as Camilleri writes. Even the interview that follows is the proof. 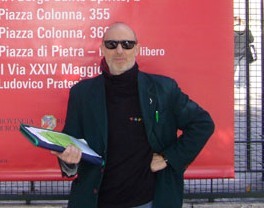 Daniele Capra (DC): Inside or outside the art system, what is the difference? Pino Boresta (PB): In the future it makes no difference, but today when an artist is presented within the system through special influential channels, it will be sure that his work will endorsement or at least a strong focus, regardless to the fact that it is appreciated, or not, by majority. PB: Yes, but what it will decree every time is the inevitable and repeated defeat of those who – despite – having a significant background work – always it will have to resign to face with a sort of systematic distrust, which affect the quality and amount of attention needed for a proper understanding of his work. DC: So, do you want simply change the system? PB: Simply! Do you think it’s not enough? We should quit with these opportunistic logic, used each time to make up Biennial and Quadrennial exhibitions for the benefit of those usual privileged artists supported by a small group of corporate galleries, foundations and institutes! 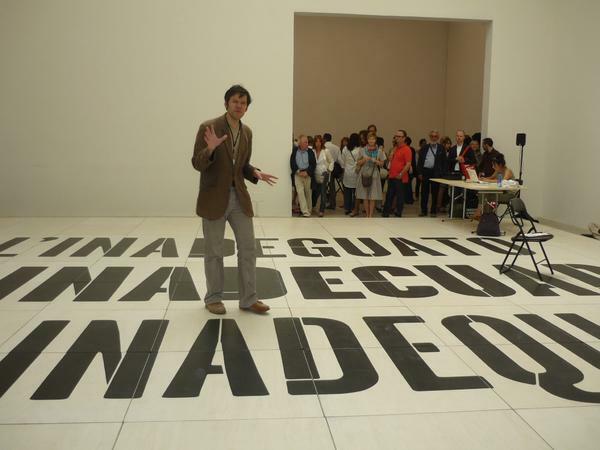 DC: So, the Sgarbi’s Italian pavilion is welcome? PB: Who knows! I do not know, for sure I did not think in a formula like that of Vittorio Sgarbi! But more than that Quadrennial will adopt, also criticized – I dared to suggest in October 4, 2008 to Roberto Pinto, Emanuela De Cecco and other, in the break of the presentation of Subrizi’s book – where will be the artists to invite other artists, even if, looking to the late bad fact about me, I do not think the things will change much for me. DC: I do not think it is important for you to become famous, but rather to help people to think about the mechanisms of inclusion/exclusion. DC: And you started immediately with public actions. When was the first? PB: One of the first subject is the one where I made the offhand that intervention I told you before, where I promoted my project Boresta’s Signature. The opportunity was the presentation of the book “Why Duchamp” by Carla Subrizi at the National Gallery of Modern Art in Rome. PB: Yes! Because I have write down a rag on the spur of the moment, that I still own. “I’m here to talk about the importance of Duchamp and his work, but unfortunately I have not prepared anything and also people have spoken and will speak more certainly competent than me. But I have a dream. No, far from it! I had a dream, dream where Duchamp, with a blond wig, urged me saying: “Go to the conference of Carla Subrizi who wrote and she is going to show a beautiful book about me”. Therefore on mandate of the great Marcello (Marcel Duchamp). I am here as a parasite, parasite of art, in attempting to make a petition as an artwork. I want to rate if a petition can become an artwork, but also I want to verify if today, an unsupported and un-promoted artist by the usual familiar faces, critics and powerful dealers, can still affect and influence this debate in its dynamics as surely Duchamp did, and I believe he would I have liked this idea. Or maybe not?”. DC: Maybe not! And then what? PB: I then distributed my flyers and collected some signatures. DC: Now, what does it remain of the project FB? PB: I know for sure that he has received it and saw it, otherwise it would be very strange for a serious curator. DC: Maybe your work interested him or maybe he’s just disgusting! PB: “Bravo!” Yeah, maybe he was interested or even hated it, but he will definitely ask someone close to him who knew better the Italian art scene, and what they have said to him I will never know, but I can imagine how since the things are gone. PB: Are you saying that if I have failed to slip myself at the Biennale, even with Sgarbi, I will no longer have any hope to succeed? PB: You may be right but I believe that at the Italian Pavilion curated by Vittorio Sgarbi, should participate only artists who make a certain kind of work, artists who make work that comes out even in the chaos of a thousand works and indeed the feed on chaos. DC: You had to ask to him! PB: I did it and he also called me, but then he told me that he is not convinced about me , but maybe this is a good sign. 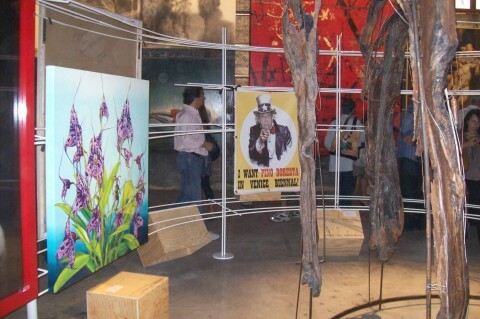 Taking part at the exhibition I would not have had nothing to lose, I do not care to hang my work stucked side by side with thousand other, when like a parasite, I hang them even over the other artworks. Do you really think that I care to compete for grabbing some public art attention within hundreds and hundreds of works of almost three hundred artists, when from eighteen years I stick up on the streets stickers with my face printed on, at the mercy of distracted every day citizens, defying the massive invasion of advertisement by which the cities are assaulted and raped? So, there is the risk to lose my battle, and every day I take my revenge. PB: But for example, it led me to you…are you “nobody”? DC: So Venice will remain just a dream? PB: But I was there at the hall and I am still there, take a closer look! DC: What have you done? PB: I unrolled my PVC poster titled “I want Pino Boresta to the Venice Biennial” and it rested there the whole day, illegally hanged. Many have seen it and i can confirm an enthusiastic Laura Palmieri. 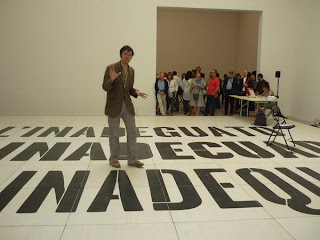 DC: Is there anything that you liked of last Venice Biennale? PB: I liked the Biennale Pavilion of Spain called “The Inadequate”. When I discovered it, I thought it was dedicated to me. In fact, I do not understand why I am not invited at the events. One of my articles that I wrote in the magazine Juliet, magazine with which I work from several years, is entitled “The out-date”, fancy that! PB: I’m right inside and over the themes of which are now debated in the art scene, having many years of work, contributing to go public, but I guess you right… I am unpleasant and I miss all the approaches, among these, they do not want me and they do not want to give me visibility. DC: Do you think you are the victim of a plot? PB: But it seems there is some dark figure plotting against me, and causes me not being there where it’s important to be there. Obsession of persecution? PB: Maybe, but when someone else tells you and confirms some of the things you think, you start to believe that, perhaps, your rating are not entirely wrong. DC: Aren’t you tired to complaining? PB: But I told you, other do it because they want to get something. I do it because it is part of the work. They want stop me! They want stop me being an artist? Well, if Cattelan leave off, as he said, I leave off to be an artist. It is the “drag effect”, but if you think that however, he got some satisfaction while I do not, almost makes me think back! Ah ah! 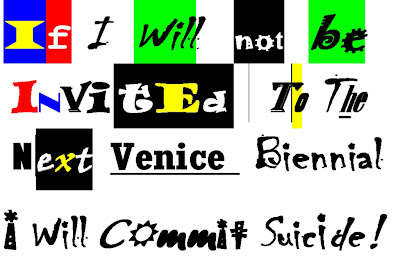 PB: I will tell you what: I give to myself another two years of time, and if I will not be invited to the next Biennial, I will commit suicide!